Can you ship silver with FedEx or other private courier services? Well no and possibly yes, let us expand on this. FedEx expressly prohibits standard shipments from containing physical precious metal silver bullion products. Come learn the facts and how you can still ship silver bullion with FedEx or other private courier, parcel and express mail services. Of course many silver bullion dealers including us use various private delivery parcel services but we use third party insurance policies and have express written agreements to do so. Most individuals involved in the process of shipping silver bullion sold back to silver bullion dealers do not have access to these insurance policies due to limited volume and size of most silver investor shipments (there are some exceptions we will allude to later on). Here are a few examples of lessons learned the hard way. 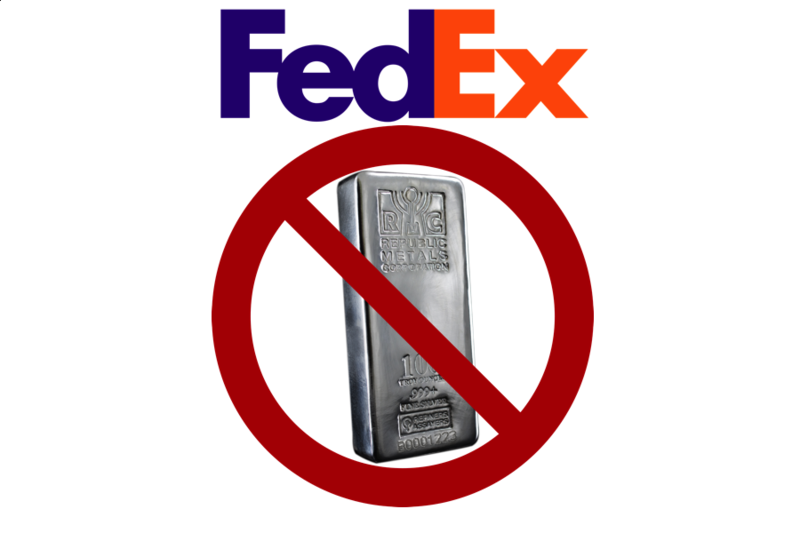 For FedEx, silver bullion shipments are explicitly prohibited for individuals without express written consent or thrid party insurance agreements in place. - Jewellery, including but not limited to, costume jewelry, watches and their parts, mount gems or stones (precious or semiprecious, cut or uncut), industrial diamonds and jewelry made of precious metal. The following is a screenshot of the same explicit prohibition for shipping silver bullion with FedEx. Again this is from section 18.4 in the FedEx terms and agreements in late winter 2018. If you are looking for fully insured silver shipping options, simply give our bullion team a call ( at 1.800.294.8732 ) to to discuss our current physical silver bullion shipping rates, options, insurance, and procedures. For those selling physical silver bullion lots in large sizes, we can also possibly provide you with convenient professional silver bullion shipping options as well.